I received an email request recently for plans to my miter saw station slash cabinet that is seen in many of my YouTube videos. Sure, why not. It is simple and easy. The most difficult thing about a build like this is getting it flush with the platform of your miter saw. Since all of them are different shapes and sizes, you are going to have to measure yours to see what will work for you. 1 - Base Piece @ 12" x 72"
4 - Riser pieces @ 2-3/8" x 10"
2- Top Pieces @ 12" x 30"
I used plywood cut to 12" wide. This measurement covered the base of my miter saw. You are going to want to measure your miter saw to see if that measurement is right for you. Then I cut the base piece to six feet or 72" in length. Cut four riser pieces. Measure the height of the platform your miter saw has. Mine was 3-1/8". 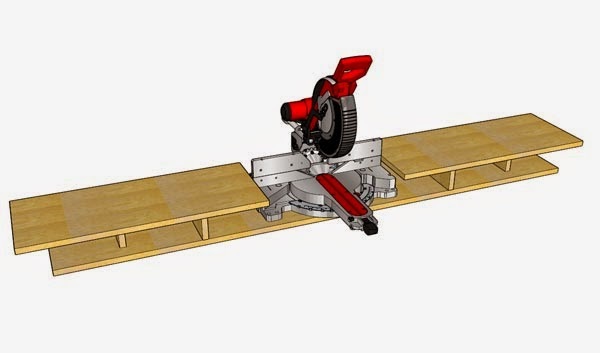 Subtract the width of the stock you are using for your miter saw station build. For me that was 2-3/8". Yours may and probably will be different unless you have the same model saw that I have. Mark eight inches in from both sides of the base piece. Attach the first risers. Then mark eight inches in from those pieces. Place your second risers. I offset my risers just in case. 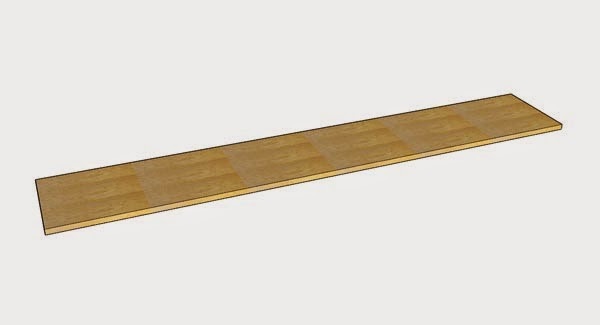 Measure the width of your saws platform. Add a quarter of an inch or a half an inch. Attach the top pieces to the base and risers. At this point I set my skil saw on the base piece, centered it between the risers and secured with screws. Then set the top pieces in place. I attached mine with countersunk screws from the top and bottom. That is it. A simple and easy miter saw station that can be placed on any flat surface. I attached mine on top of a roll around cabinet that I had built earlier. A couple of diagonal supports help support the weight on both sides of the overhang. Some storage is created by the risers. I keep a couple stop blocks and two clamps underneath mine. If I need them, I know exactly where they are at. Later I will share the design for my roll around cabinets. Check back often for that or sign up for email updates and never miss a new post and design plan. Just enter your email in the box to the right.